Today is Frozen Yogurt Day. I hope you all celebrated appropriately. Me, I forgot to check the calendar this morning and had a small panic when I remembered that today was a day that would require an ice cream maker, and that means the ice cream maker base had to be frozen, and oops, it was still sitting on the counter. Luckily Google came to my rescue (all hail our robot overlords) with this recipe that requires no ice cream maker at all. Richard swung by the grocery store on the way home to pick up the necessary ingredients (frozen peaches) and after dinner tonight we broke out the food processor and gave it a whirl (ha, see what I did there). You start with frozen peaches, yogurt, sugar, and lemon juice. Then you blend the peaches and the sugar until they’re mostly combined, and add in the other two ingredients. It sounds pretty simple. Except that when we tasted it, the sugar didn’t really dissolve so it was kind of weirdly grainy, and there wasn’t much of any flavor at all. Inspiration struck. I tossed in about a teaspoon of orange extract (doesn’t everyone have that in their cupboard? 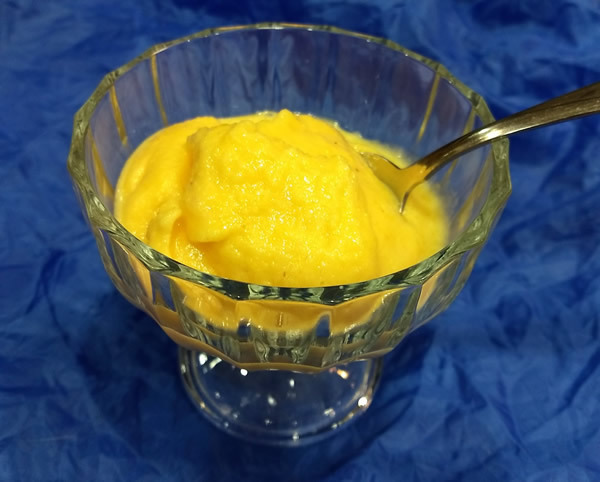 ), added a little more sugar and a dash of vanilla as well, and then blended it like crazy and stuffed it into the freezer to sit and think about what it had done, and also in the hope that this would give everything a chance to meld. And hey, what do you know, it worked! 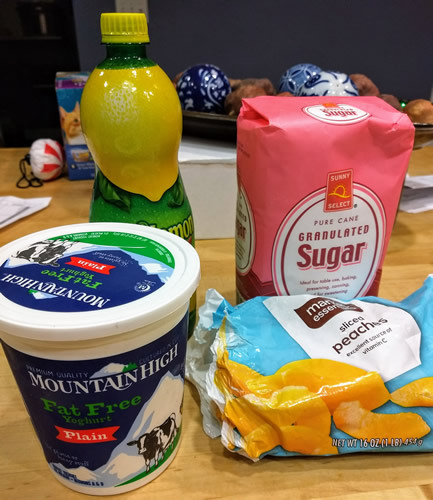 Half an hour in the freezer and the sugar had all dissolved into the rest of the mixture, and the orange flavor came through. Still can’t taste peach at all, but no matter, the orange made it perfectly yummy, and we both agreed we might be willing to make this again.